Quicksilver is a metal with a low melting point that is melded with Moonstone when forging elven weapons and elven gilded armor, and with Ebony and Steel when forging Nordic carved armor and weapons. 3 quicksilver ores are obtained by mining quicksilver ore veins. 1 quicksilver ingot is obtained by smelting 2 quicksilver ores. Quicksilver ingots may be sold by blacksmiths starting at level 18 and general goods merchants starting at level 10. 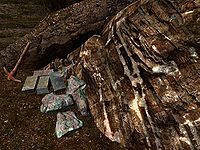 Quicksilver ore may be randomly found in Falmer loot starting at level 5. There are a total of 57 veins, 10 ores, and 13 ingots available in the game. The following list only includes notable locations, in particular locations where multiple veins are located near each other and interior areas containing veins or ingots. The Quicksilver Veins category contains a more complete list of places containing single veins, and all exterior ore veins are shown on (map). 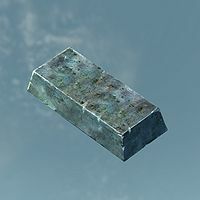 Quicksilver ingots are used to improve Nordic weapons and armor DB. Quicksilver ores can be sold to Leigelf for the quest Mine Ore.
A special sample of quicksilver ore is used in the miscellaneous quest Truth Ore Consequences. It has no other uses — it cannot be smelted into ingots. 1 quicksilver ingot is needed at workbenches to improve elven gilded armor. 1 quicksilver ingot is needed at grindstones to improve Bolar's Oathblade and Dragonbane. 1 quicksilver ingot is needed to build an alchemy lab table if this North Wing addition is chosen as part of a Hearthfire add-on home. This page was last modified on 20 May 2016, at 20:45.